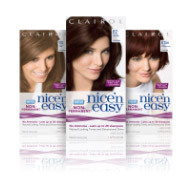 DISCLOSURE: I received a coupon for a free box of Clairol Nice 'N Easy hair color from Clairol and Vocalpoint to try and review. All opinions are my own. 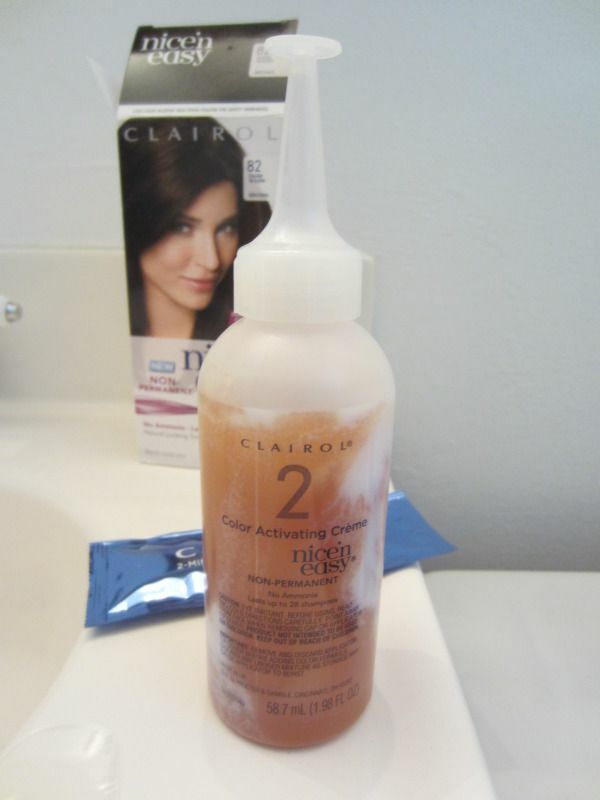 So before I go into reviewing this hair dye from Clairol, I need to give you some back story on my adventures with hair dye. I've always been bad at dyeing my own hair. It wasn't that I was scared to do it, it's just my hair is so dark, nothing really showed up. Plus it's so thick, it's hard to apply it to every single strand. I started with using Sun-In when I was in high school. You sprayed it in your hair and either used a blow dryer or went out in the sun to activate it. It was supposed to bring out your natural highlights. I ended up with somewhat orange-y hair. Later, I moved on to semi-permanent and permanent hair color including Nice 'N Easy, Garnier Nutrisse, Natural Instincts and others. Nothing really changed my hair dramatically. This is a pretty bad picture of me since this was taken this morning after I got the kids up, fed and ready for school. So no make up and slept on hair! But you can see my hair is kind of reddish brown but with dark black roots. I'm holding up the box of Nice 'n Easy that I received from Vocalpoint. It took me forever though to pick out which color to go with. I wanted something that would blend easily with my roots and make it not so dramatic. But I also didn't want to go too dark. I ended up choosing #82 Dark Warm Brown. I figured it would darken some of the red, but not so much that it would all be black. What is Nice 'N Easy Non-Permanent? It's just like the name says. It's non-permanent and gradually washes out in 28 shampoos. It's great for first-time colorers, who don't want to make a long-term commitment. After about a month, your hair is back to the way it was. It's pretty easy to use and it's supposed to give you natural-looking tones and dimensional shine. It comes in 12 different shades, ranging from Dark Ash Blonde to Black. Like the name implies, it is nice and easy to use! You put the gloves on. Unscrew the cap of the Color Activating Creme and pour in the Color Formula. Put the cap back on the Color Activating Creme and shake it! Here's a picture of what it looked before I shook the bottle. Once the mixture is blended and thickened, you take the tip off the cap on the bottle and start to apply it to your hair. This was the hardest part for me. I have really thick hair. To make sure I applied the dye everywhere, I used a hair clip to section my hair, so I could apply the dye to each section. Once you've applied the dye everywhere, you leave it in for 15 minutes. Then rinse it out until the water runs clear. Apply the conditioner and rinse after two minutes. I kept a towel on over my clothes because whenever I dye my hair, I seem to get it everywhere. I managed to get it on the walls, the bathroom rugs and on my shorts! We'll see if that comes out. I probably didn't use enough since there are still some areas that are kind of red. But it definitely blends with my roots better. I think I might either continue to use this once it washes out, or go to the salon and get a similar shade put in. Yes! Again, like the name says, it was nice and easy to use! The hardest part for me was trying to figure out what color to go with. Partly because my hair was already dyed. I think for a first-time colorer, it will be easier. It's best to stay within a few shades of your natural color. Clairol also has a tool on their website to help you choose what color to go with. The color looks great. We'll see how quickly it washes away. I got my bottle at Target and it was priced at $7.99. So, two weeks later, my hair is starting to go back to the way it was before. It's not as dark as it was when I first colored it and my roots are more noticeable. I've washed it pretty much everyday since I used the Nice 'N Easy, so about 14 washes. I'd still use it again, though I have an appointment with the salon today! I see it's been a year since you posted this but I wanted to share a tip on getting the color to last longer. Your hair will be shinier, healthier, and the color will stay longer if you only shampoo 2-3 times a week. You can still rinse it, use a little conditioner, but just avoid the shampoo. There are color-protecting shampoos, but as long as you don't use a clarifying shampoo, you should be ok with whatever you prefer. Looks great (even two weeks later)! Thanks Samantha on the hair color tips! I've had my stylist tell me, also, not to shampoo everyday. But, for some reason, my hair just feels like it needs to be shampooed everyday! I've been bad about keeping up with my color, too. Right now, there's a definite line between the colored hair and my natural color! i like the first hair color the best. Oh wow really? I thought it was too red for me. sorry but I like the first three colors much better. Thanks, I like some of the red. I just didn't like it all being so red. Right now, my hair is even darker, but hoping to get back to the salon to lighten it up again.